Sports and Safety Surfaces are a UK based company that work nationwide and we install all types of sports surfacing including 3G grass pitches, artificial all weather pitches, athletics surfacing and tennis courts. We also offer a number of services for these facilities including cleaning and painting, sports line marking and surface maintenance . 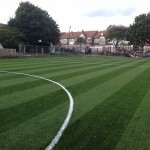 With a wealth of knowledge we can cater for all clients with various budgets from small kickabout ball courts or a full sized synthetic turf football pitch. We offer costs and prices for building the facility, carrying out maintenance and installing extra equipment for all the different types of surfacing available. 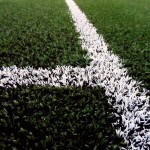 3G Pitch Artificial Grass – This surface type is ideal for a football and rugby MUGA pitch as it is infilled with a layer of rubber crumb granules which help the pitch to provide natural playing characteristics. The third generation synthetic carpet is usually installed onto a shockpad which gives support to players’ joints and prevents injury while taking part in training or matches. 2G Sand Filled / Sand Dressed Synthetic Turf – This artificial all weather pitch specification has a layer of silica sand infill applied at the base of the synthetic grass fibres. By installing this sand the turf pile is kept upright and gives great playing qualities for football and hockey as it lets the ball to roll evenly across the pitch. Needlepunch Synthetic Turf – A fibre bonded woven artificial grass surface which is extremely durable and can come in a range of bright colours and rainbow designs. 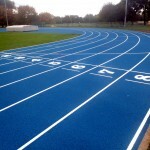 Needlepunch specifications are often used for multi use games areas and long jump athletics runways. The reason the MultiSport synthetic is generally used for these facilities is because the flooring is the most hard wearing and durable carpet in the market with great slip resistant qualities with the surface meeting accreditations EN 15330 and also BSEN 7188. Polymeric Rubber Surfacing – Made up of EPDM rubber granules which are mixed together with a binder, polymeric surfaces are commonly installed for netball courts, MUGAs and athletics tracks. Anti slip paint coatings can be applied to a polymeric sports surface to improve grip and enhance the game play qualities. 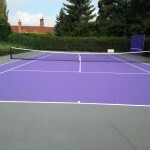 Macadam Surfaces – A popular choice for schools, macadam specification is a hard wearing sports court facility which requires little maintenance. Its good ball bounce capabilities mean that macadam lends itself to tennis surfacing and netball sports surfaces which can be painted in anti slip coating to meet TRRL 75 needed to meet AENA standards for netball governing body. Design and Specification – First you need to decide on what your primary sports are going to be, this will determine the best surface type for the facility you’re looking to install. For example if you’re going to be playing football and rugby, a 3G pitch artificial grass surface would be the perfect option, but if you wanted to play netball and basketball then a polymeric or macadam surface would be best suited. You also need to know the area size that the facility will be installed to and any extra equipment you will need included within the construction process. Groundworks and Foundations – Once your specification and designs for the new facility are finalised, the first on site installation works will be to excavate the existing area and prepare the ground. A geotextile membrane will almost always be applied first, this prevents any weeds or contaminations growing up through the surface. Next the sub base is installed, this will either be a dynamic sub base made up of lots of angular stones, or an engineered macadam sub base, depending on the specification of your chosen surfacing. Shockpad – When the foundations have been set out, you can then have a shockpad installed before applying your surfacing layer itself. A specialist sports shockpad helps to absorb impact and prevents injury to players when taking part in sports. Having a shockpad installed is not required for every surface, but it is necessary with all weather pitch facilities which are used for contact sports like rugby. Rugby shockpad underlays are usually installed with a 60mm monofilament yarn synthetic grass carpet installed. 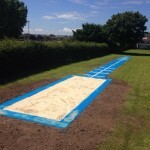 Surfacing Installation – Once the groundworks and shockpad (if required) have been installed, the next stage of the sports facility installation is to apply the chosen surface type. 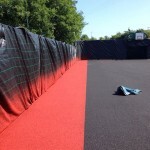 This is where the process differs slightly for each surfacing specification as artificial grass is rolled out like a carpet and joined together with seams, whereas polymeric rubber and macadam surfaces are poured out onto the base. All of our surfacing systems are permeable to allow good water drainage, meaning that the facilities can be used in all weather conditions and throughout all times of the year. Extra Equipment and Accessories – This could include fencing, floodlights, ball stop netting and sand filled synthetic turf maintenance equipment. All of these MUGA sports facility extras can help you get the best from your new sports surface by maintaining the playing qualities and enabling you to rent it out to other clubs and teams. Anti Slip Coatings and Line Markings – It’s important to have the best playing characteristics for your sports court or MUGA. A fresh non slip paint coating will enhance the grip of a macadam or polymeric surface, and clear line markings ensure accurate game scoring for a range of sports. Tennis Court Maintenance is carried out annually where the surface is cleaned and every few years repainted generally in a two tone coloured design. Chemical Treatments – If your sports surface becomes contaminated with moss and algae, it can be a nightmare to remove it and restore the surfacing back to its original quality. This is why we offer chemical treatments which prevent the growth of moss and algae and keep your sports pitch or court clear from any contaminations which could cause damage. Redistribution of Infill – Artificial grass all weather pitch surfaces which have sand or 3G pitch rubber infill installed can often become compacted and lose their porosity, leading to flooding. This is why you need to regularly redistribute the infill particles by drag brushing and grooming the grass pile, this also helps to remove any dirt or debris. Damage Repairs – If your synthetic sports surface becomes damaged through overuse or vandalism, it is necessary to carry out repairs as soon as possible. This could be repairing seams on an artificial grass surface or recapping a damaged polymeric or macadam area. Infill Rejuvenation – This process is carried out to replace contaminated sand infill from an all weather pitch with a new layer of clean sand. Rejuvenating an artificial sports pitch helps to restore the original playing qualities and prevents any damage to the surfacing. Resurfacing – If a synthetic MUGA court, all weather pitch or athletics track surface becomes very damaged and is in extremely poor condition, it may be necessary to carry out a full resurfacing job. This involves ripping up and disposing of the existing sports surface and replacing it with a brand new surface. Sport facility resurfacing projects in the UK commonly involve replacing a muddy natural grass pitch with an artificial surface. At Sports and Safety Surfaces we try our best to make sure not only the client gets an amazing new facility within budget, constructed and surfaced on time but we also want to go the extra mile in supporting you wherever possible. This could be simple advice on maintenance techniques to giving information on suppliers of equipment for a multi use games area. We as a company have grown massively over the years and can help many organisations such as schools with funding for new sports facilities. We understand that it can be a hard task to try and source funding for large projects like this, but we are very well connected with many governing bodies and are therefore able to help with this. If you have any queries about any type of surfacing specification or the funding opportunities we have available and do not want to fill in our contact form you can easily tweet @james_dooley for guidance or follow @soft_surfaces to look out for latest developments. We regularly post updates and videos to our Sports and Safety Surfaces youtube account which can be looked at through the link and you will see a variety of projects for schools, universities, sports clubs. All of our social media accounts are constantly updated with new case studies and news articles of our recently completed projects so please don’t hesitate to follow us to keep in touch with all the latest news.